Atoms are made of a positive nucleus, containing positive protons and neutral neutrons, with negative electrons orbiting around them. 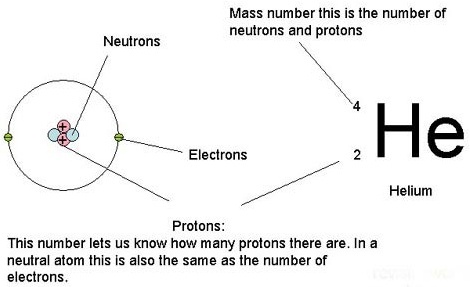 Mass Number: this is the number of protons and neutrons in the nucleus. Atomic Number: this is the number of protons in the nucleus. Isotopes: atoms of the same element that have the same number of protons but a different number of neutrons. They have the same atomic number but a different mass number. At the turn of the century, we did not have the same model of an atom as we do now: the accepted model was the Plum Pudding Model, shown on the right. 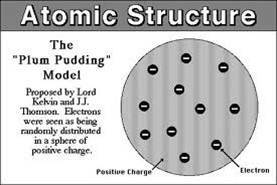 The atom was a sea of positive charge (the pudding) with some points that were negative (the raisins). Rutherford performed an experiment to test this model. He fired positive particles, alpha particles, at a sheet of gold foil. His results are shown below. 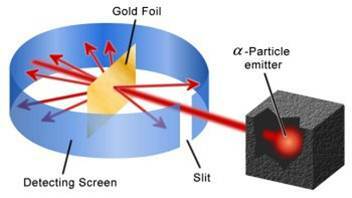 Expected Results: because both the alpha particle and the majority of the atom was positive, it was expected that these two positive charges would repel each other and the alpha particle would be slightly deflected (bent) as it traveled through the foil. Most of the alpha particles traveled straight through the foil without being deflected! This meant that the majority of the atom must be empty, uncharged space. The alpha particles that were deflected were deflected by a much larger amount than predicted. This must mean that the centre of the atom or nucleus, must be very densely positively charged. Because so few were deflected they must also be very small. A very small amount of alpha particles were reflected back. 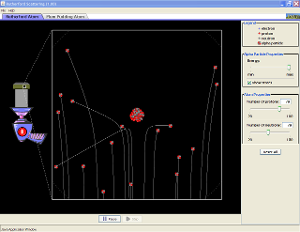 These were the particles that had approached the nucleus head on. The fact that they were reflected shows that the nucleus is strongly positively charged. The fact that so few of them did this, again, implies that it is very small. A diagram of the results is shown on the right. 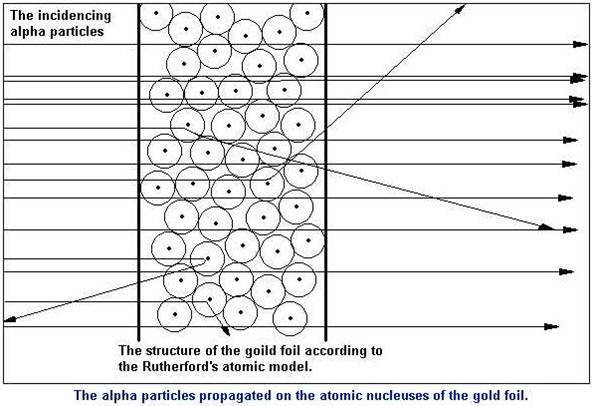 This helped Rutherford to produce the model of the atom we use today.